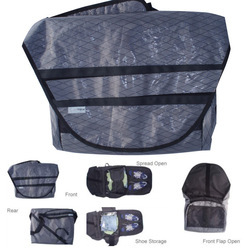 This messenger is specifically designed to carry your clothing, computer and gear to work, office, school, gym, airport or wherever you commute. Front stash pocket for easy trips through the security lines at airports or on the run. Two stuff pockets for accessories and a clear pocket for easy to find items.